More Insurance Agency has a passion to help others. 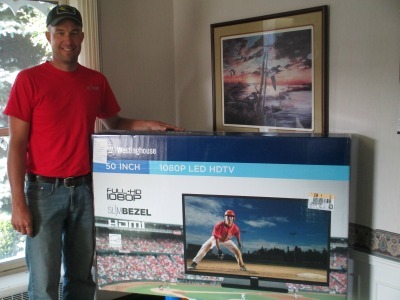 This year, at the Whiteside County Fair, a 50″ flat screen TV was donated to help support the local non-profit organization, White Oaks Therapeutic Equestrian Center, or WHOA. WHOA, also located in Morrison, IL, offers therapeutic horseback riding and animal-assisted activities as well as other related services for children and adults with disabilities. It has been associated with the Equine Assisted Activities (EAA), which has been known for beneficial forms of exercise and recreation for people with a wide variety of disabilities. WHOA combines goals, sports, recreation, therapy and education in its lessons. Lessons run from April-October, and have day and evening hours available. Lessons include basic instructions of grooming, tracking, horsemanship, riding and/or driving skills. Every lesson is taught by PATH certified instructors. Volunteers sat in the commercial building the entire fair week raising awareness to the public about this fantastic organization. The lucky winner this year was Melissa Henrekin. Husband Matt (pictured) said Melissa was overjoyed when she found out she won, yelling, “I never win anything!” I guess her spell has been broken! Congratulations Melissa and thank-you for supporting WHOA.